Ok, this one is gonna be quick since technically I ate it last week (sorry, backlogged again!). I enjoyed my first sample of blue bunny frozen yogurt, so I couldn't wait to try another. 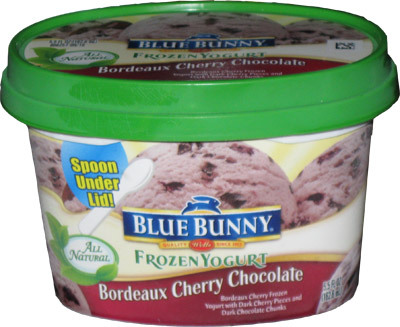 You know, I've never heard the term dark cherry pieces before.... well, technically I've had black cherries in my ice cream before, but now the use of the word dark and we're not talking about dark cherry furniture here. You know, it's probably just a regional thing, no worries. Here's my little friend the blue bunny spoon again. Here we go! Don't ask about the weird crater in the middle, it came that way, it's just one of those things. Now the question is, are those dark spots chocolate or are they cherries? Ummm, technically I forget. 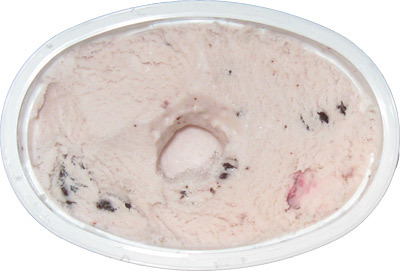 You see, when I think about this flavor, I only remember really the black cherry. If I try real hard, I think I vaguely remember the chips adding a nice little bit to the treat. I guess my point is that they went well together. Had they annoyed me, I would have remembered. Now this may sound rough, but you know what I like best about this flavor? It's small. You see, it's got a decent texture for a froyo. It's got a taste that has a bit of bite to it without going overboard. It has all the makings of a fine treat, but I just cant handle dark (black) cherry night after night. This treat is just big enough to say "hey, that was nice, let's do this again in 6 months". Contains active cultures of L. acidophilus and bulgaricus, Bifidobacterium sp. and S. thermophilus. Saw this at the grocery store and thought I'd give it a chance. So happy I did. I've had 1/2 cup servings everyday since I purchased it. Could do without all the chocolate pieces and more cherries but nonetheless it's a perfect snack for me with a little protein.